Here it is. Everything you need to know about walking the Cape to Cape track. The Cape to Cape track runs from Cape Naturaliste to Cape Leeuwin, in the south west corner of Western Australia. The trail is 135km long and features 4 low key campgrounds as well as a number of other “Off track” accommodation options. The Green trail on the map below will show you the route of the trail. The track predominately runs along the coast, but also goes inland into Jarrah forests and karri forest. Walk independently carrying a hiking pack and sleeping in tents at the campgrounds. Walk with a guided tour group that will take you back to accommodation each night. The terrain on the Cape to Cape track is mostly moderate. Whilst there are not a lot of hills when compared to say hiking in Tasmania or Nepal, there are still challenges to walking the Cape to Cape track. The greatest challenges are the beach stretches (especially when they are soft) and the length. At 135km most people take about 7 days to complete the entire trail. For people who walk the Cape to Cape track carrying a back pack and tent, it can be a challenging but wonderful experience. There are many places where it is possible to access the trail in order to do shorter “day walks”. The best time to walk the Cape to Cape track is from March to May and September to November. Both March and November can be quite warm, but certainly not really hot. As the trail is coastal, there are not a lot of tall trees, so consequently not much shade. We have found anything over 25 degrees Celsius is quite warm. When it is over 30 degrees, it is starting to get pretty uncomfortable. Here is a link to the weather statistics for Cape Naturaliste which will show you the average rainfall and temperatures for the year. From June to September, walkers need to concern themselves with the river crossings. The crossing at Wilyabrup and the Margaret River mouth can be uncrossable during winter. Wilyabrup is usually okay by September, however the Margaret River mouth can often be still uncrossable right up until October. To check current conditions, see below section “Things to be wary of while walking the Cape to Cape track”. We always recommend walking North to South i.e. Cape Naturaliste to Cape Leeuwin. Some people will tell you that it is better to walk South to North so that you have the South Westerly wind at your back. This is terrible advice. These are the reasons that we recommend North to South. If you walk south to north, you will have the sun in your eyes the entire time. The south westerly wind is only particularly strong during the summer months, at which time it is not advisable to walk the Cape to Cape track. If you are coming from Perth, by walking North to South it makes it much easier to start walking on the same day that you drive down, as it is 1.5hrs closer to Perth than Augusta (Cape Leeuwin). The trail terrain and distances between campgrounds are much more manageable in the north than they are at the southern end. We have found that it is better to have easier walks at the beginning of your hike and more challenging towards the end, as you can build fitness of the course of the hike. If you want to walk on a tour, come with us! If you are planning on walking the Cape to Cape track independently, carrying a back pack and sleeping at the campgrounds. Our recommendation is to follow the proceeding itinerary. Leave early from Perth, and drive to Cape Naturaliste. It is about a 3.5 hr drive. Leave your car in the carpark at Cape Naturaliste and let the visitors centre (08 9755 3955) know when you will be back to collect it. 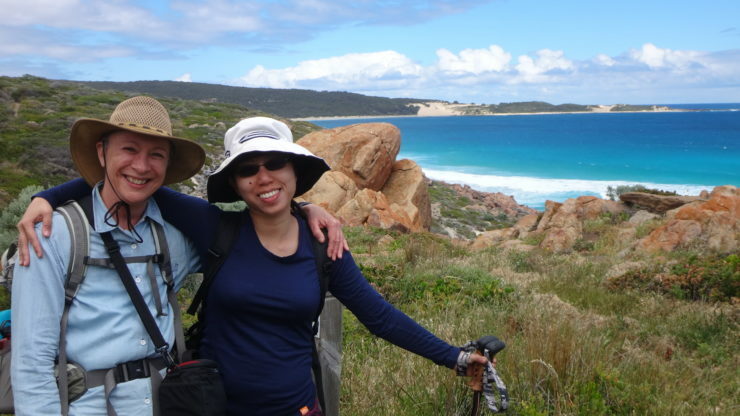 Walk 14km to Yallingup Caravan park. The walk should take you about 5 hours going at a reasonable pace with breaks. There are not too many challenges with this first walk. The trail is easy to follow and there are only two short beach stretches. The first 3km through to Sugar loaf rock are actually all paved, so really easy. FYI – there are toilets at Cape Naturaliste, Sugar loaf rock, 3 Bears and at Mt Duckworth campsite. Toilets every where… Hurray! Cape to Cape Track – Rocks!!! But not many. A longer more challenging day today. There is some soft beach sand to negotiate on Smith’s beach as well as Injidup beach. There is also a bit of a rocky stretch which can be challenging when you are carrying a big pack. When you get to Injidup beach, there is a huge set of stairs that goes up to the car park, where there is a toilet. This is a good spot for a lunch stop and there is a little bit of shelter under the trees in the corner of the car park if it is hot or raining. The afternoon is mostly on sandy four wheel drive tracks and is a bit boring. You will pass through Moses Rock car park where there is a toilet. At this point you are about 3km or 60 minutes from the Moses rock campsite. Look out for Kangaroos through here. The campsite is free to use, so just turn up. One of my favourite days on the whole track! This day has some beautiful coastal scenery as some great deep red rocks. The walking is easy and on a nice day, it is just magical. The area around Wilyabrup is really stunning. There is a huge stainless steel staircase. When you get to the top of the stairs, the trail goes off to the left, however if you turn right you can get out onto the cliffs which are really worth the short diversion. WARNING: Is Wilyabrup creek crossable? We have only ever had one occasion outside of winter when it hasn’t been crossable (it was September when we couldn’t get across) but it is worth checking particular if there has been a big down pour or there is a big swell. Check the dbca’s website for current conditions. Just prior to Whaleback rock there is a great spot to stop for lunch. There isn’t much shelter on this day, but there is a little bit of a rock overhang where you can get some relief. If it is a nice day, this is a great spot to watch the waves crash in. Take care when you get to Gracetown as there are lots of false paths. Officially the path goes along the beach, but it is soooo much easier to walk along the road to Huzzas. Stop in and get an ice cream too! After Gracetown it is an easy and beautiful stretch on to the low key campsite at Ellensbrook where you will find a toilet and rain water tank. The campsite is about 10 minutes past the Ellensbrook Homestead so don’t camp there! The Ellensbrook campsite is free to use and you do not need to book. Much of the morning is inland away from the coast. The trail then pops out onto a wonderful stretch of beaches and is truly divine. You can camp or grab a campsite or cabin at the Prevelly caravan park or any number of other accommodation providers in Prevelly. This is also a great place to resupply as there is a small store/bottle shop. A really special day. From Prevelly you head inland to Boojidup brook with it’s massive set of stairs (don’t worry, going down). From there it is out to the coast with a tough, soft beach stretch up to Redgate beach. There is a toilet at the Redgate beach carpark, then it is back down on the sand for a short stretch. From the beach you then make your way slowly up to one of the most spectacular sections on the whole trail. There are some amazing cliff top vistas just prior to Contos campground. You can either camp at Contos or Point Road which is another 20-30 minutes up the trail. Our recommendation is point road as it will be quieter and it shortens the distance for the next day. Both campgrounds have a cost to camp which is $22 for 2 people per night. These sites are best booked rather than just turning up, as they are very popular. You can book the Contos and Point Road sites at the Park Stay website. This day is tough. You start in the forest, which is just beautiful and quite easy. Then you make quite a sudden but thankfully short climb out of a valley and head towards the coast where you eventually meet Hamelin Beach. From there it is a 6km beach stretch to Hamelin Bay. This can be really hard when there is a head wind or the beach is soft. Try to find some tyre tracks to walk in, or take you boots off and walk next to the crashing waves where it is usually firmer. If you are feeling like stretching it out, you can stay at Hamelin Bay ($$$) or just grab an ice cream and continue on. After Hamelin Bay there is a short but challenging stretch with some short sharp hills. Soon enough you will reach the Foul Bay light house, and then it is an easy walk to Cosy Corner rd. From Cosy Corner Road it is an easy walk along an interesting limestone shelf that is full of blow holes. Then you round the Cape and on a clear day will get your first glimpse of Cape Leeuwin lighthouse! The end point of the trail. The Deepdene campground is about 20 minutes up the beach in a sand dune blow out. Look out for it! You will see a gap in the dunes and then walk up the track for a few minutes. This is another low key campsite and you do not need to book it. Last day! And another challenge. This is a big day with some more beach stretches. There is also some limestone ledges which you will need to negotiate. The beautiful thing about today, is that you can see the Lighthouse almost all day. It starts off tiny and gets bigger and bigger as the day goes on… sometimes not quick enough! The official end of the Cape to Cape track is the Water Wheel just prior to the Lighthouse, but everyone goes to the Lighthouse and they will let you in for free (especially once they smell you!). From the light house you can either hitch hike into Augusta or grab a taxi. The light house will call one for you, but if this is your plan, make sure you are there by 5pm otherwise it will be closed! There are quite a few accommodation options in Augusta. My recommendation is to stay at the Augusta Motel where you can anything from backpackers room to something more fancy. Day Eight: Return to Cape Naturaliste then drive back to Perth (or where ever). There are buses from Augusta back up to Dunsborough with TransWA. The bus takes about 1.5hrs to get to Dunsborough. From Dunsborough, you will need to take a taxi up to Cape Naturaliste to collect your car. The river crossings can be treacherous and it is important to have up to date information when walking between May and September. Please call the DBCA or check their website to get the most up to date information. If you do choose to do a river crossing while carrying a heavy pack, always unclip your pack, keep an eye out for incoming waves and never dawdle on the other side. Unexpected king waves are common in the area. Snakes are not actually much of an issue unless you try to pick them up. Most of the time we just see a tail disappearing into the bush, as the snakes are definitely scared of humans. The chances of being bitten are so small, that with just a little bit of knowledge, you will be fine. A good reason not to go hiking in summer! Bush fires are unpredictable and can be deadly. Thankfully they are rare, and they rarely kill people on the coast as they are easier to escape with the low vegetation and frequent vehicle access. Hiking in summer is not advisable but if you are going to do it, please read this blog post for some tips about how to hike safely. There are water tanks at all of the camp grounds, so theoretically you should be okay. The water is untreated though, so you will need some sort of water purification system. Our favourite is good old fashion condi’s crystals.